It all felt like if I was back to Paris in a way. There is no way to get a table at Uilliam's for dinner on the weekend if you do not book it in advance. Two days in advance seems to be safe. Even more similar to Paris, you do not necessarily get an answer right away when you give a call to make a booking. This might take certain effort. What went even further than Paris was the two hour limit for the table booking. If you book for, say, 6.30 pm it lasts to 8.30 pm. The entrance is tiny and the sign is unnoticeable. "Did you make a reservation?" - politely but firmly the host asked after "Good evening". 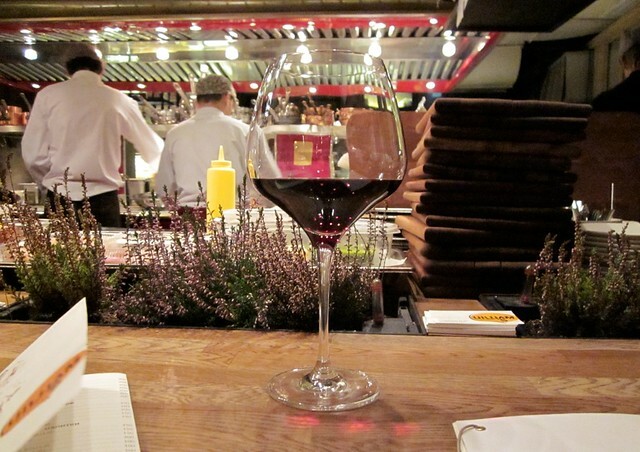 I came some 10 minutes early and the table was not yet available, so I got seated at the bar overlooking the open kitchen with a glass (a truly beautiful one) of montepulciano and started observing. The dining hall was no more than 15 tables and was packed. The waiters were moving around fast serving some amazingly looking and amazingly smelling food. The cooks were also fast and precise, using ingredients (prepared already to a high extent) to put together and finalize the dishes. It seemed not easy a job at all. The first things attracting attention on the menu were grill (ribeye, Angus beef, lamb ribs, gilt-head bream and octopus) and roast of the day (duck, chicken, rabbit and quail). Several tempting appetizers e.g. duck with rocket and mango or artichoke and goat cheese bruschetta. Risotto/pasta, e.g. home made spaghetti with crab and seafood sauce or black tagliatelle with octopus, scallops, shrimps and basil. When I was starting to go crazy because of waiters constantly hitting my chair standing at the very corner of the bar I got moved to the table. The kitchen was now even more visible, but my friends were late for some 20 minutes already. Not to get upset about that I started with an appetizer. The bruschetta with crab, iceberg salad and avocado arrived soon and absolutely took me over. The thin and crispy slice of bread soaking in delicious sauce was not even visible under the fresh and crisp salad. All that with avocado and sweet pieces of crab meat made me forget about everything else. The waiter asked whether I needed bread or hummus to complement the meal. I never saw hummus offered in this manner, especially at Italian restaurants. There was no way I could refuse that. Hummus was fine. Finally, my long waited dear friends found the place and joined me. At first - with what was left from my bruschetta. Then we picked and ordered the food. First came the home made lemonade - with strawberry syrup and, well, cucumber. Very fresh and appetizing. The girls went for a roasted quail garnished with mini potatoes, mushrooms and bacon. Didn't try it, but the speed at which it was disappearing was reassuring about the taste. 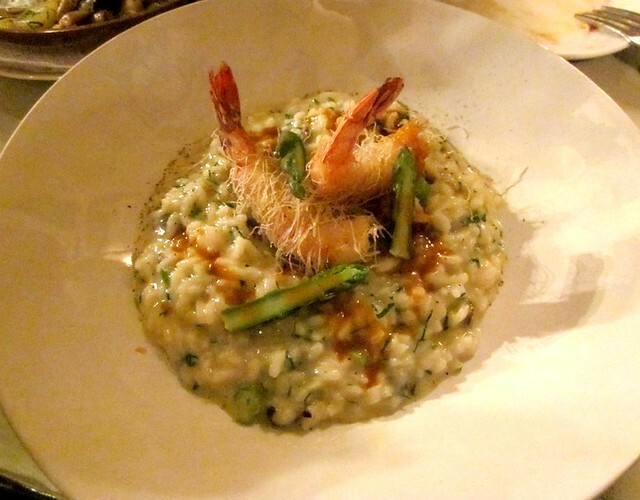 I went for risotto with shrimps and zucchini. I had hard time picking a dish - many things on the menu were really tempting, but as soon as the risotto arrived I knew I was exactly right. It was full of intense flavor. The shrimps fried in crispy pastry threads made a beautiful texture contrast. Wonderful how different it was from another great one I recently had at l'Osteria. It seemed the food was gone in a moment and there you go - it was 8.30 pm. We got [politely] reminded about the approaching deadline, paid and left. It was a true evening of contrast. Contrast of the food, which was out of this world, with a sharp back to earth hassle. Of the prices with the feeling of stiff competition for the space. Of warmth and comfort light of the hall with dark and cold street. And it was so much worth it. P.S. 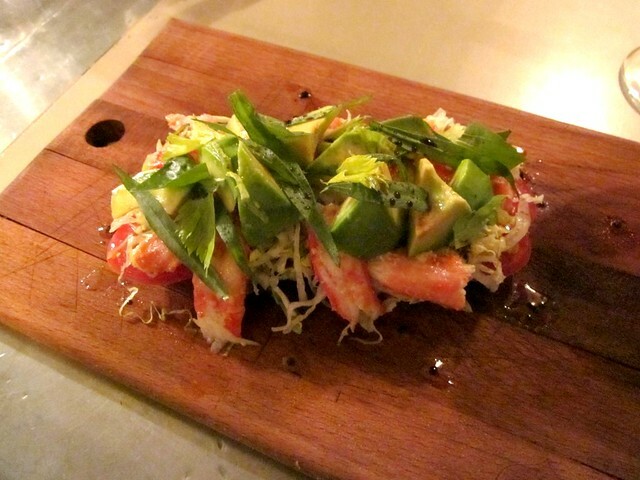 From December 1st, 2011 on Uilliam's announced the start of vegetarian menu. So now I'm looking for my next chance to visit it.